Yes. I did. I made another junk pumpkin this year. I used some of this junk. These junk parts were originally part of a knife sharpening tool my Grandpa had rigged up in his garage year's ago. I blogged about this acquisition here. I picked it up this morning from under a tree in a flower bed and cleaned it off, and set it up on one of my potting benches. As luck would have it, I had three clearance packages of rusty angel wings on hand. (I'm sure I bought them for a junk re-purposed angel) but today I needed rusty triangle eyes for a pumpkin, and this stuff cut with an old scissors. So I made a pattern with two triangles for eyes, a smaller one for a nose and a toothy grin. I am terrible about tutorials, but I am sure you could make the standard pattern for a Jack o'Lantern features. My projects never go step by step. There is the idea, trial, error, trial, error, trial, error and success. Usually, success. Not that easy to tutorial-ize. So I glued my rusty pumpkin features on with a little E6000. I also tied a few pumpkin leaves on the handle with raffia. I think it's pretty cute from the front. I used the rusty pulleys for mini pumpkin holders. The diamond frost on the bottom shelf spent the summer on top of my garden step ladder. You can see that here. We had frost last night here so it's days are numbered. I will have to replace it with a pumpkin two. I added a couple of old funnels and a watering can to my potting bench display too. I am seeing junk pumpkins everywhere! Just adorable, I love the gear pumpkin! You are just too clever! another adorable junk pumpkin is born!! Loved seeing your junky wonderful fantastic pumpkin and the entire vignette on one of your potting tables. A visual treat. Brilliant I say! Brilliant! So cute too. And the rust color is perfect for pumpkins. How can a plant called Diamond Frost not like frost? Okay, this is my favorite of the whole bunch! I love the vignette on the potting bench. You had frost last night and I spent the afternoon swimming laps in the pool to cool off! She's adorable! You are so creative. How great is that pumpkin! Love it...so creative. Carlene ... I'm glad you made another pumpkin because this is my favorite. 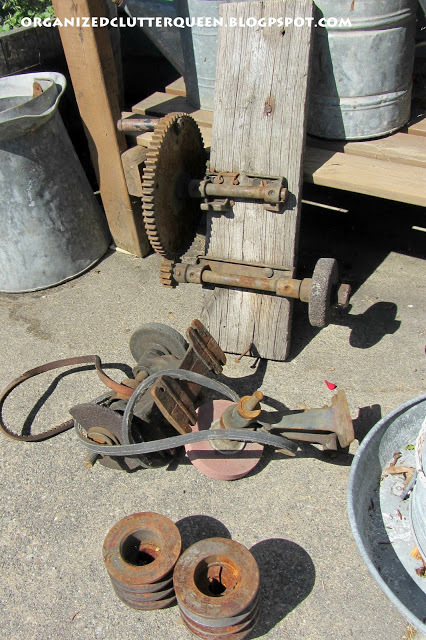 I love old gears and this was just perfect and it looks great on your potting bench. You are just so creative. Okay...now this is my new favorite! Every time you post a new junk pumpkin it becomes my favorite!! Don't stop! Now Carlene, this is just too darn cute. I love it, girl!! This might just be my favorite one. I even had to show it to my husband. This is the cutest one yet.....I think your other pumpkins just might be jealous! Love your creativity.....thanks for sharing. My heart be still. This is my favorite!! LOVE, love, love this one, too!! Your jack-o'-lantern is adorable! I have quite the collection of jack-o'-lanterns for October, but not one like this. I need to try and make my own version. Thanks for sharing! Enjoy your day! Your jack-o-lantern is absolutely adorable and amazing@! You are one creative girl!!!! 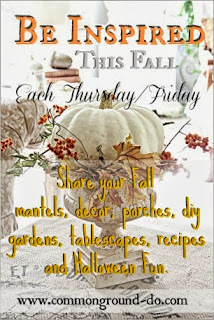 Come over to Tutorials Tips and Tidbits and share this super fall creation!!! Link is live now! I can't even tell you how much I love this, soooo creative! I don't know how you come up with all these creative ideas, but I sure wish junk pumpkins and such would just spring into my head. Love it! Love your pumpkin junk! You are just so very creative. I'd like to live inside your brain and learn to be as creative as you are! Love the jack-o-lantern on the gears and its little sidekick mini pumpkins!